Makhana or Foxnuts are puffed lotus seeds that are immensely healthy and tasty. You can just roast them with a few spices and they make for a light and delicious munchies. You can make tasty curry with them like this Makhana Curry that I made. 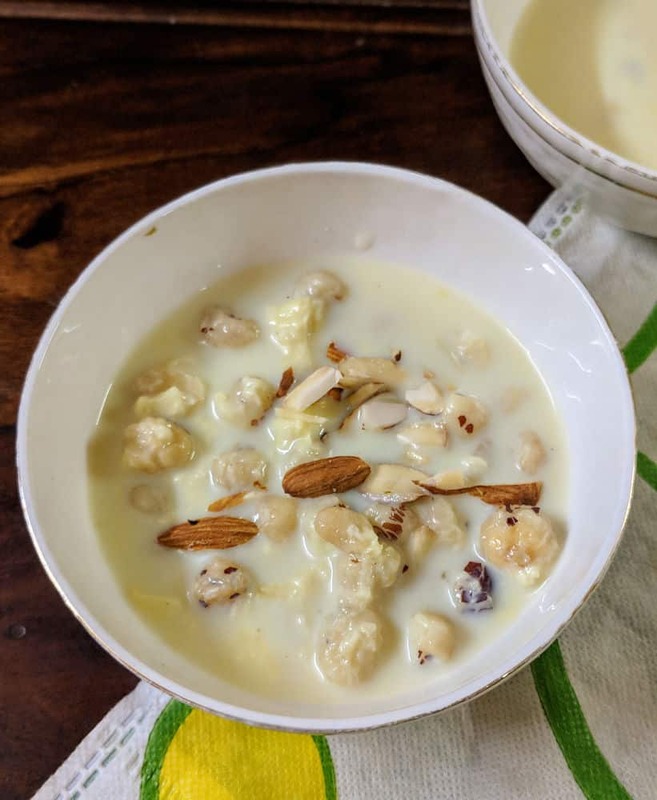 Or if you are in a mood for something sweet, this easy makhane ki kheer is the perfect dessert. Made with just 6 ingredients, any one can make this to perfection. This is also the perfect vrat recipe if you are fasting during Navratri. 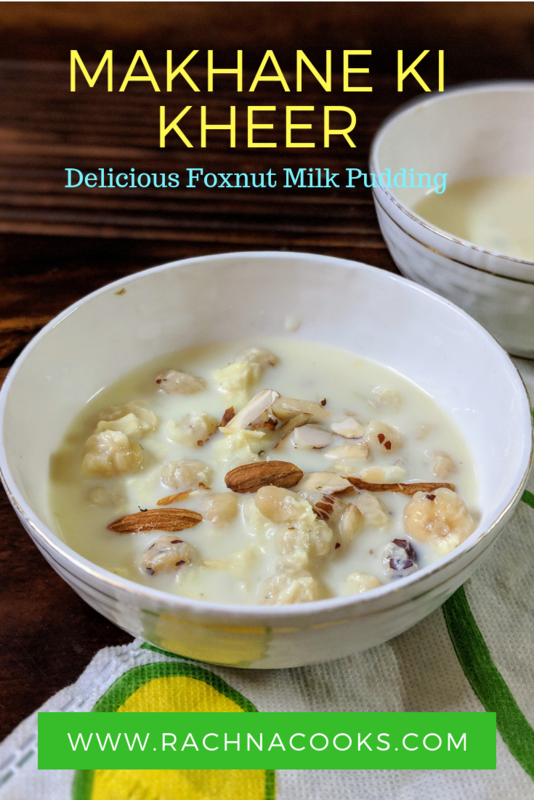 This is a delicious Indian sweet made with makhana or foxnuts. It is perfect for vrat during Navratri or as a sweet dessert even otherwise. Lightly fry the makhana or foxnut along with cashews in ghee. Keep aside. When cooled, take half the makhana, cardamom seeds and most of cashews and blend in a blender. Now heat milk in a kadhai/pan. Add the blended makhana and cashew mix to it along with sugar to the milk. Add the whole toasted makhana as well and cook on low heat for about 15 minutes uncovered till the kheer becomes slightly thick. Take it off the heat and serve hot or cold with slivers of nuts. Your makhana kheer is ready to serve. 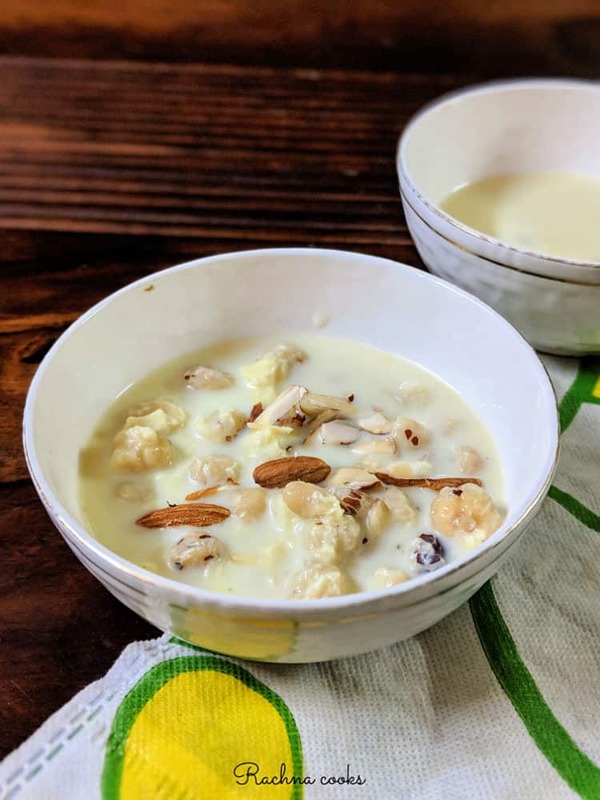 Hope you enjoyed this makhana kheer recipe and will try it at home. Do also share this recipe with your friends if you liked it. Here are the other Navratri recipes that you can try: sabudana khichdi, sookhi arbi, sabudana vada, kaddu ki sabzi, kachche kele ke kebab. Not sure if I’ve had this; I don’t eat Indian sweets too often and don’t make them at all…they’re a bit too sweet for me. Having said that, this does look enticing. This seems simple enough, and sounds delicious. Thank your for this recipe, Rachna. Bookmarked (and pinned) to try!